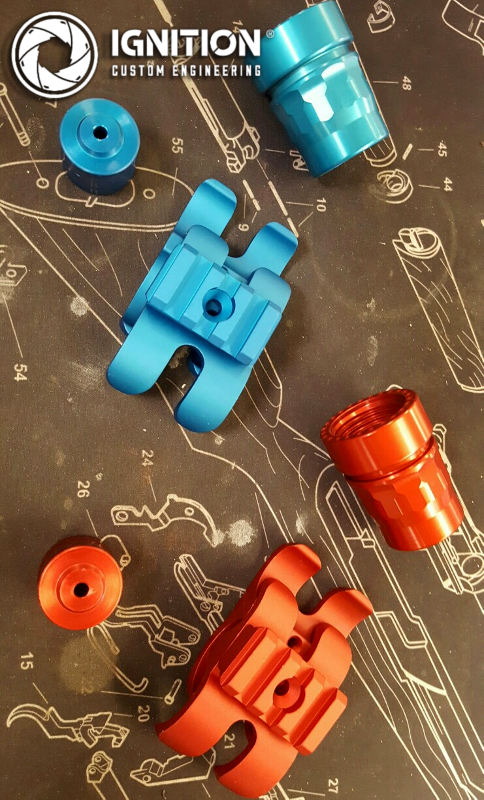 Blue and Red barrel clamps, magazine nuts and followers created by the talented ICEng team for Adler and other 12ga shotguns. With the rising notoriety of the Adler, Pardus and other 12ga shotguns in Australia, there seems to be more and more variations among the models of shotgun available. 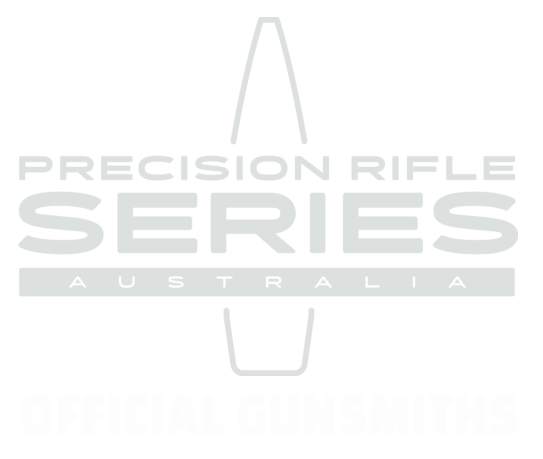 Some of these are functional like barrel length but many changes are cosmetic, like if the stock is wood or synthetic material or the colour of the action. And why not? Everything about you says something about you. Firearms can be very personal and a reflection of identity. In response we have created series of colourful and eye catching shotgun accessories so you can “pimp your 12ga” to suit your style. 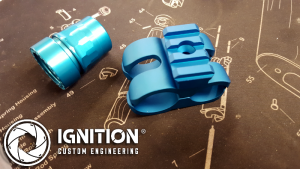 For several months our ICEng aftermarket shotgun followers and magazine nuts have been available in red, blue, silver, black and gold. Black is standard and timeless, but the red and blue have been hot selling items. Aftermarket mag nuts and followers in silver, blue and red on Pardus, Uzkon and Adler. Its time the popular Ultralite Barrel Clamp and Tactical Barrel Clamp with removable picatinny rail options caught up. This month we are offering a limited run of red and blue Ultralite Barrel Clamps and Tactical Barrel Clamps (with removable picatinny rail). 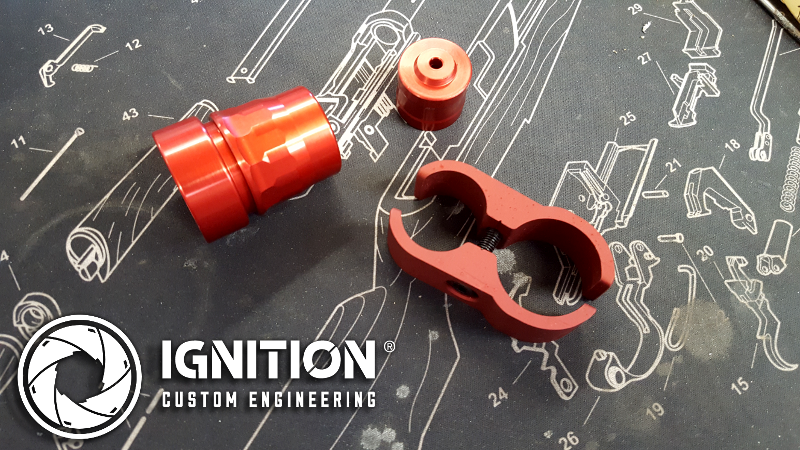 Ultralite clamp, follower and magazine nut in red to suit the Adler, Pardus, Uzkon and other 12ga shotguns. The finish is slightly darker than the follower and nut, but creates a stunning impact when teamed up together. The red really rolls with the Adler “Rockstar” model (which features an action finished in red). The blue set produces a perfect picture when paired up with the blue Pardus. 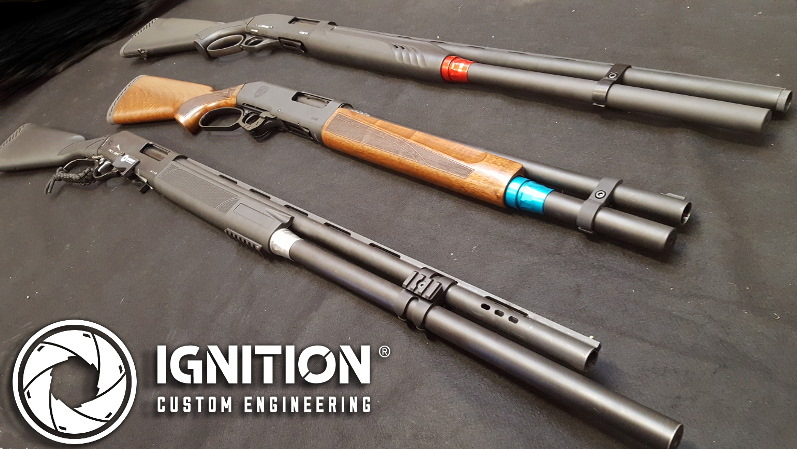 Either option creates an eye-catching and custom look to the standard wood stock or synthetic stock shotgun (or if you want to go all out, email us about a Cerakote job). Both barrel clamp styles are designed for use with an ICEng extension kit (there may not be enough tube length to fit it on the factory 5 shot version). The Ultralite is compatible with Adler, Pardus and most 12ga lever action shotguns. The Tactical Clamp with removable rail is compatible with most shotguns but is better suited to the +3, +5 or +6 extensions. It does not suit most Pardus models. The follower and mag nut bundle, plus the clamps are all available at our webstore.